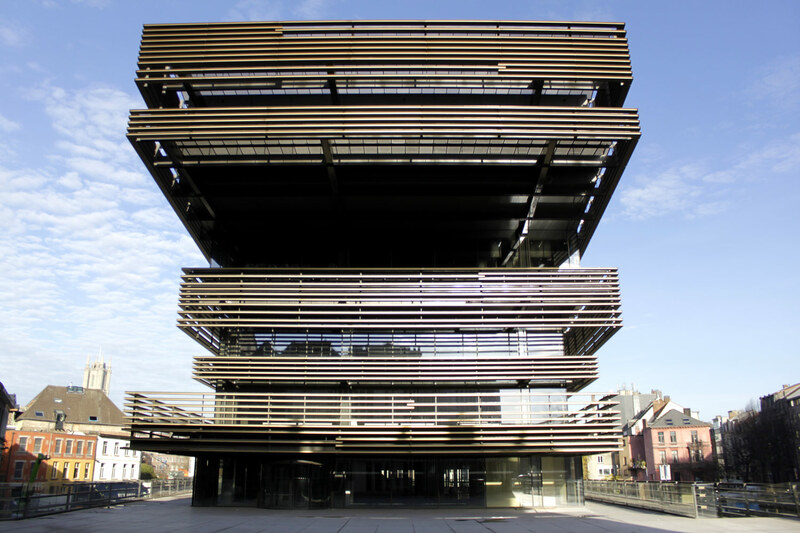 Embedded in the center of the city, in a sharp bend of the river Schelde, a building that reads as a stack of horizontal disks has been erected. 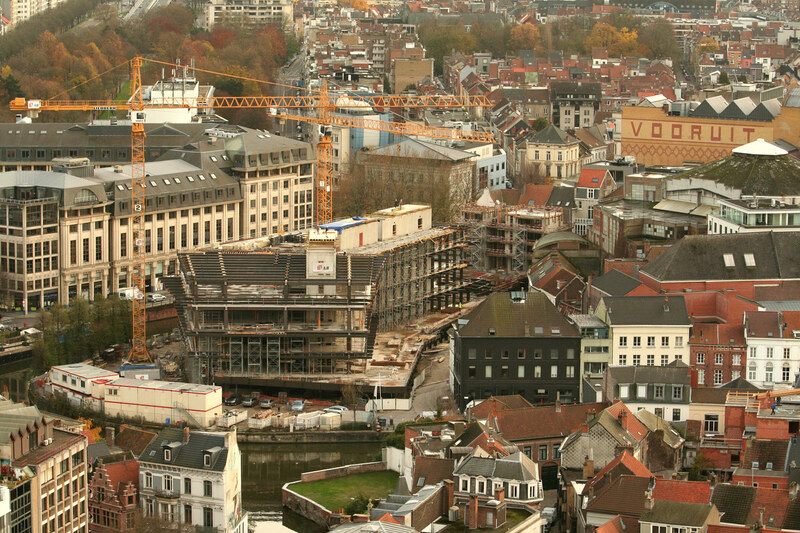 This construction of 8 levels houses the new city library, among other functions. The building program, part of a larger master plan, extends to a vast area around the impressive main building. It also involves the realization of an elevated square, a bicycle park, 2 cycle and pedestrian bridges and a small housing project on the south side of the raised square. This project is the result of an international competition won in 2010 by TV COUSSÉE & GORIS architects / RCR Aranda Pigem Vilalta Arquitectes. 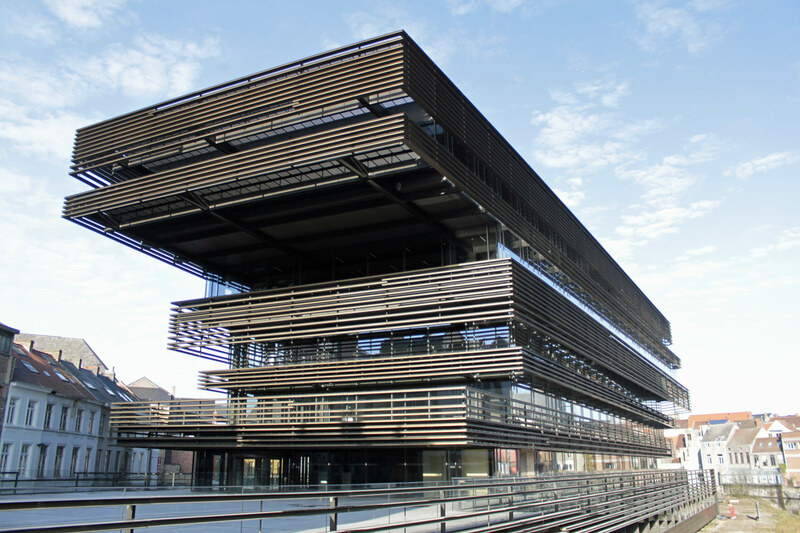 RCR arquitectes won the prestigious Pritzker Architecture Prize 2017 in March 2017, which was a positive incentive for the opening of De Krook. 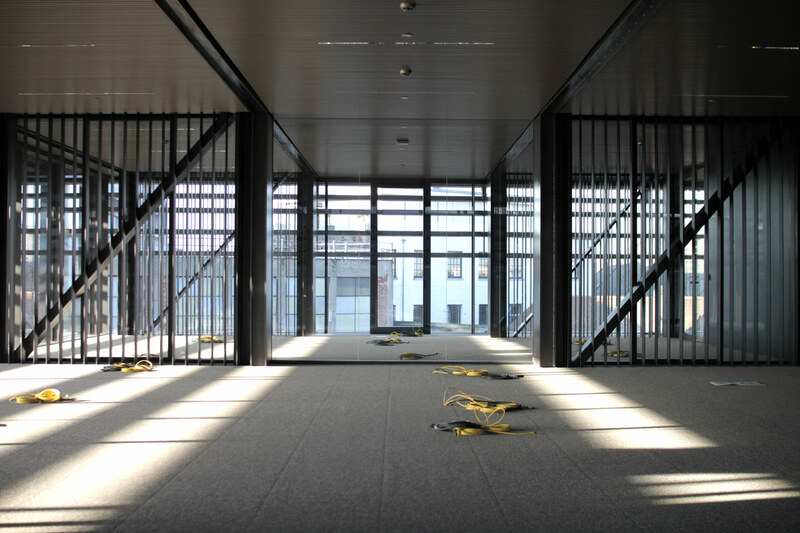 The structural grid of the main building determines strongly the architectural design. It consists mainly of 3 central concrete cores and 3 alongside column rows, which stagger from place to place. The glass facades have per level a varying distance with respect to the outer 2 column rows. Porches ensure the vertical stability of the building. The porches, placed every 3m20, consist of steel beams and columns, and bear the concrete wide-face floors. 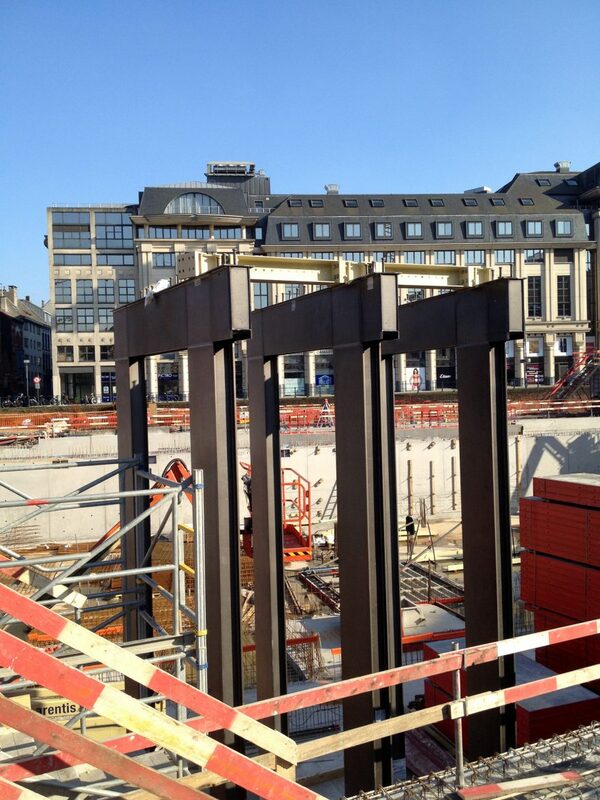 The outer dimensions of the beams and columns are 550x180mm and 600x180mm and are made of sheet steel. Only the recessed (short) plates of the columns vary in thickness according to the upper load. The visible steel structure determines strongly the character of the building. In order to valorize the material, the steel is treated with an extremely thin nanocoating, instead of the current fire-resistant paint that masks the color and texture of the steel. To ensure the fire resistance, the hollow tubes are poured with concrete. The horizontal stability is ensured by the concrete floors that act as discs and transfer the horizontal forces to the 3 concrete cores. These cores are prominent elements in the interior. On the inside, they are casted in slick formwork, on the outside a formwork of vertical shelves was applied which cause a visible wood texture on the dismantled concrete wall. 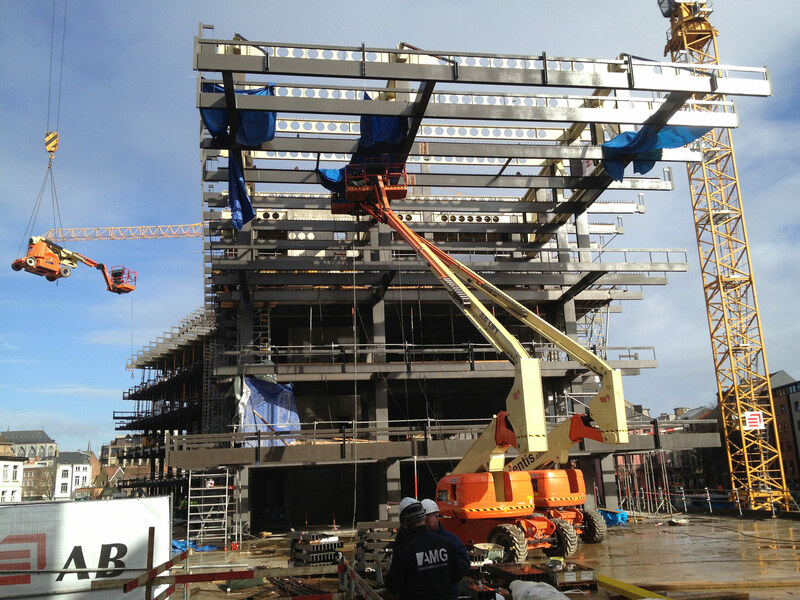 The climax of the construction is an impressive 15.5m cantilevered level at the south side of the building. The cantilever is possible thanks to 3-storey high atypical trusses, complemented with cantilevered beams bearing the terrace. The atypical trusses are a mix of lattice work and Vierendeel truss. On the north-east side, the floors +1, +2 and +3 hang over with respect to floor 0. This cantilever of about 6.7 m is supported by the Vierendeel action between the beams and columns at level +2 and +3. The southern bridge connects the raised square with the Kuiperskaai, the northern bridge connects De Krook with the Brabantdam via Sint-Jansvest. The bridges are welded steel structures. The southern bridge is conceived as a half porch. The road surface is clamped on the side of De Krook in a torsion free hollow tube, welded on a column pair, which is clamped on a concrete deep foundation. The road surface itself consists of solid T-profiles, covered with a concrete layer. This creates a composite floor of steel and concrete, whereby the concrete layer has a stiffening effect and serves as a wear layer. In addition to pedestrian and cycling traffic, the southern bridge must also be able to handle fire and other vehicles for public services. The northern bridge is built in 2 phases. 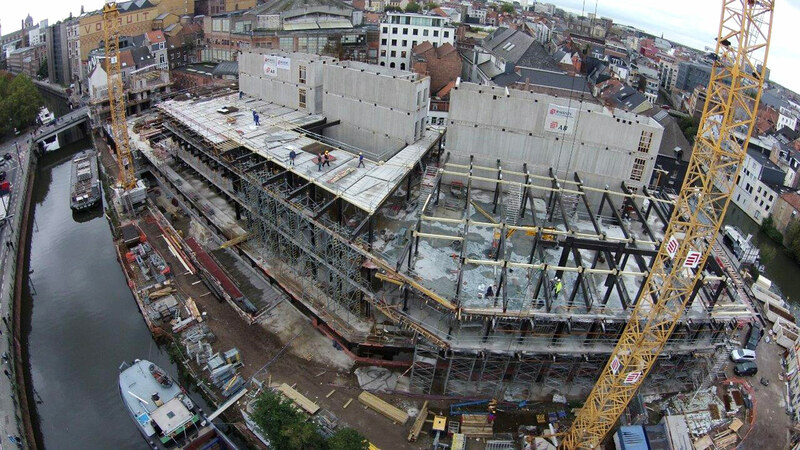 The first part starts at the building and makes the crossing to Sint-Jansvest. From there the bridge will be extended to the Brabantdam. The steel structure consists of 2 trusses between which the bridge deck is provided. At the same time, the trusses serve as a balustrade. The bridge deck is made of a steel ribbon floor, a sheet steel and casted concrete as top layer. 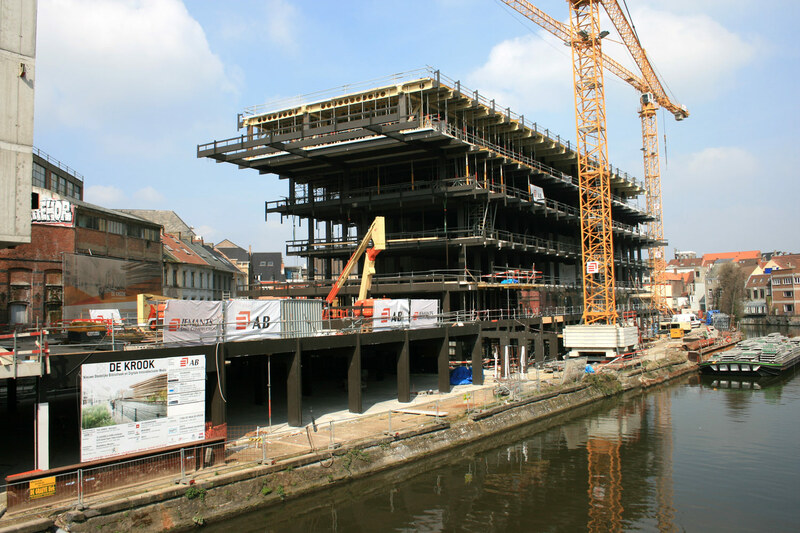 The first part of the bridge rests on 2 steel columns on the side of the building and 1 column on the side of Sint-Jansvest. At a later stage, the bridge will be extended with a second part. On the peninsula of Sint-Jansvest a second pillar will be placed as support of it, on the side of the Brabantdam a pillar will be placed on the lowered quay wall of the old weir next to Braemgaten.